What’s So Great About Oral Diagnostics? Out of all those fluids, blood (or serum) has been the preferred liquid. It is extremely rich in information and can expose a lot about a systemic condition or report on ailments located deep within the body. You have to filter it if you don’t want the blood cells in your sample, but it’s just a needle prick away. Other ‘fluids’ like mucus or saliva require a bit more work because of how thick and viscous they are, plus you need to filter out the debris floating around in your mouth. If blood is so great, why do we need anything else? Although blood is a great global fluid, sometimes you can get more detailed information by going closer to the source of the problem and choosing a more local fluid, but perhaps one of the greatest reasons is because the process to obtain the blood is still invasive. In the ideal microfluidics world of the future, we would need very small sample sizes and pin pricks wouldn’t be that bad. For now, spitting into a cup is still easier than and more enjoyable than getting stuck. Plus, exposed blood is always a health concern, and should definitely be avoided if possible. Okay, so I guess you can see why you might want to investigate other fluids, but why saliva? Like I said before, there are some analytes from the blood present in saliva in lower concentrations, like C-Reactive Protein (CRP). In fact, tests have been proposed to monitor growth factors, drugs of abuse, steroids and infectious diseases using oral fluid. CRP is a possible indication of inflammation and is released in events like heart attacks. Detection of this protein along with others can be a good indication of an acute myocardial infarction, but you wouldn’t be able to use that alone. CRP may be present for other types of inflammation, especially a local one occurring in the mouth. But let’s not focus solely on detecting global diseases and problems. It’s still valuable to detect diseases in the mouth. Periodontal disease is a common oral infectious disease that is a leading cause of tooth loss in adults. Currently, clinical practices don’t have the capability to detect the onset of inflammation leading to periodontal disease and can’t identify the patients at the greatest risk for disease progression. A Point-of-Care device to detect this onset would permit earlier detection and could be utilized outside of the dentist’s office. Testing for periodontal disease can become much easier and widespread since you don’t need a highly trained professional to run the test, and it can be done in health care clinics or at home. There are many underserved communities that cannot afford to visit the dentist, but cheap, regular screening for disease can allow them to manage a disease before it gets out of hand. Additionally, preventing oral diseases can go a long way for the rest of the body, as periodontal disease has been connected to cardiovascular disease, stroke and osteoporosis. Finally, oral fluids can play a part in pharmacogenomics studies. Pharmacogenomics is the marriage of genetics and pharmacology. While we may think that we understand the processes of diseases, the diseases and their treatments can vary greatly from person to person depending on genetics. In an ideal world, every single drug and treatment we receive would be tailored specifically to our DNA. There is still a lot of work needed to find out which genes have greater effects on both the disease and treatment, but in order to learn more and to eventually provide tailored treatments, we need to understand our own DNA. Oral fluid can be a great source to obtain that DNA. The DNA we use can come from anywhere, so why not easily dislodge some cells in the mouth instead of pricking ourselves with needles? No matter what fluid we’re using, or disease we’re screening, we need to design these devices with the clear motivation for them to be used outside our labs, and in the wild. How would you detect a heart attack? There are some symptoms that might tell you that you are very likely having a heart attack. Although you might feel pain in the chest, shortness of breath or other known physical symptoms, that doesn’t mean you in are actually having one. Conversely, you may not experience these symptoms but an attack is well on its way. In addition to painful symptoms, an electrocardiogram can be used to further indicate if you’re having a heart attack, but it also isn’t always accurate. But what if you could detect a heart attack by monitoring cardiac specific biomarkers in the blood or saliva? Those attempts are well underway. Detecting anything in bodily fluids is always a good time for our friend microfluidics to enter the scene. Even after the correct biomarker is established, it must be quantified in a quick and demonstrative way. While biomarker levels vary in statistically significant ways during disease, they may still occur at low levels, making detection very hard. John T McDevitt et al. fulfill this need in “A disposable bio-nano-chip using agarose beads for high performance immunoassays.” I actually worked in Dr. McDevitt’s lab while I was at Rice University, so I’m pretty familiar with his work, although I didn’t work on this project. In this paper, Dr. McDevitt develops a system of agarose beads for immunoassays that can be implemented in a microfluidic system and tests it on C-reactive protein (CRP). CRP is a biomarker that is elevated during inflammation or heart attacks, which could make it useful when detecting or confirming a heart attack when used in conjunction with other biomarkers. This process uses a sandwich immunoassay, which we’ve seen before when detecting ovarian cancer. However, in this case, 280 µm agarose beads are used to house the immunoassay process. These beads are very porous, providing a large surface area to volume ratio, which affords many antibody-capturing locations to be stationed on and within the bead. Other beads made of polystyrene would only allow capture antibodies on the surface, and would not be able to detect as much of the biomarker in the same volume. While the porosity of the bead allows the detection to be enhanced, the shape of the bead is also important in this immunoassay. This system is comprised of an array of microscale PDMS cups, each containing an agarose bead. The cups are shaped like inverted pyramids and feature a small hole at the bottom that allows for fluid to drain. This setup drives fluid through the beads by convection, as it is the only exit point for the fluid. In its simplest form, the system contains three stacked layers: the middle layer contains the microarray of inverted pyramids, which is surrounded by two PDMS layers containing the microfluidic injection and drainage channels. The middle layer is made of an epoxy, and actually originates from a lithography-produced silicon mold. The silicon mold looks exactly the same as the epoxy, but due to the cost and process to produce the silicon, it doesn’t make sense to use it in each system. Instead, it is used as a mold for PDMS, which itself is used to mold epoxy, giving us a copy of the original silicon. 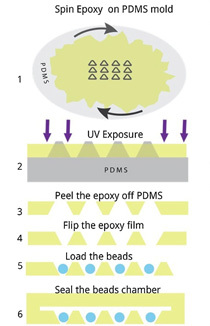 The resulting epoxy layer can be incorporated by irreversible covalent bonding to the PDMS layers. The agarose beads are first incubated with CRP specific capture antibodies, capturing the CRP as it is forced through the agarose beads. 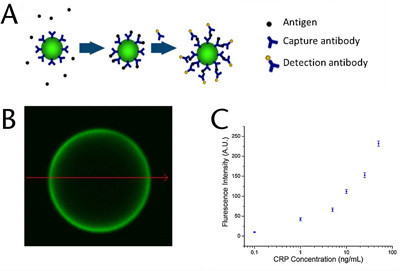 Detection antibodies are fluorescently tagged and are pumped through beads, specifically attaching to the anchored CRP. The fluorescence of the beads will correspond to CRP concentration in the sample. In order to calibrate the system properly, control beads are also included in the array which contain antibodies for another antigen. This system is able to produce a precise dose-response curve. Its limit of detection is about 1 ng/ml, which is far below the physiological range of CRP, but may be used while processing saliva, which must be diluted several times since it’s highly viscous. You can also see that the fluorescent green signal infiltrates the bead and is not limited to the surface. This demonstrates the porous agarose bead’s ability to capture more CRP and deliver a stronger signal. This system was also simulated using the computational fluid dynamics program COMSOL, and the results were similar to those found in the real world. Interestingly, there are some special considerations to think about when measuring the intensity of the beads. Not all flow through the array is equal. First, there is a bit of a pressure gradient across the beads such that the beads closest to the source experience the greatest pressure and those further away experience slightly lower pressure. The increased pressure causes more CRP and tagged antibodies through the beads resulting in a higher signal. Second, the size of the drain in each pyramid may vary, which would again affect the pressure experienced by each bead and its resulting intensity. Finally, any deviations in the bead shape will alter how it sits in the inverted pyramid. Once again, smaller beads sitting lower in the holes will experience higher pressures and signals. This paper presents the final component in an immunoassay intended for microfluidic chips. While there are many other processes which must be carried out before the biomarker level can be measured, this method can also be used for a range of biomarkers and is only limited by the nature of the fluid and the concentration of the biomarker.